Catriking in Ottawa: First day out! It was absolutely gorgeous today, just as the weather dudes had promised. Actually, the weather has been really grand lately, with sunny skies, warm temperatures and no precip to speak of...until this past Sunday when it poured like mad. But, unlike the past two summers when it did nothing but rain - so it seemed - this was a wanted rain. The showers, drumming steadily against the roof of the house and swirled about the skies by the brisk easterly winds, washed all that blasted road salt away! By this morning, the skies had stopped pouring with rain and, when the sun came out, the roads dried. To be sure, we still have lots of fine gravel spread fairly evenly across the road - but at least it won't dissolve the catrikes. It was still pretty windy today, which is typical for this time of year as weather patterns shift from the stability of winter to the stormier spring, but the winds didn't sting. They were still coming from the east (predominantly) but the day was warm for this time of year and the sun was shining brightly. It looked like the perfect day to get our catrikes out and go for the first run of the season. We waited until lunch had settled before heading out but some dusting off of things came first, starting with checking the tires. My trike has three Schwalbe Marathon Racers and they are rated for 85psi. 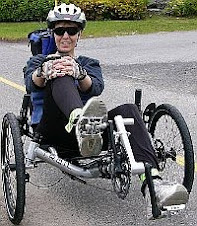 Adam's trike, the 2006 Catrike Speed, has two Schwalbe Kojak tires, inflated to 100 psi, on the front with a Schwalbe Stelvio, also inflated to 100, for the rear tire. Adam pumped up the tires and, after ensuring no air was leaking for any reason, we were off to the races. Well, actually, I was off first. Anxious to get out on the road, I plunked myself in the seat and did a quick run just up and down the road. MAN, it felt SO GOOD just being out on the trike. While I was zipping up and down the road, doing speeds ranging from 13 to about 25 km/hr, I did a quick check on the shifters, the brakes and the steering. I am very happy to report that three months spent in the garage with nothing more than an old shower curtain draped across to keep it clean did nothing bad to it. When I got back to the house, grinning as I was, I saw that Adam was ready to go. We snapped a couple of pictures (Adam takes much better ones) and, before long, we were both out on the road. We only went for a 6 kilometre run, half of that spent beating into the still gusty easterly winds, but not only did we have a ton o'fun but we did some sprint runs downwind on, basically, empty roads. With Adam being much taller and more muscular than me, naturally he clocked higher speeds. At one point, he reached 39 km/hr on the same run that I touched 34 km/hr. My Catrike Trail shifts very smoothly and, just like last year, the brakes were both responsive and even - no pulling from either side. I'm debating on whether or not I want to buy a pair of clipless shoes. I am told that I can increase my speed by up to 20% as I would be producing power throughout the entire cycle and not just when pushing down. It's a nice idea but not necessary. Tomorrow promises to be a carbon copy of today so perhaps we will head out once again to add to the 6 kilometres we already did so far this season.